Owning a rambunctious dog with a lot of energy calls for a ton of open, outdoor space! Fortunately for those in Virginia, getting outside for playtime is easy in one of the state’s many spacious dog parks. Venture out to one of these dog parks to burn off some extra energy with your pup. Here are our 10 favorites from around the state. Shirlington Dog Park is one of the best in Arlington, Virginia. This park is sure to delight your four-legged friend. Two areas, one for large and one for small dogs, are available so that your pup has friends of his or her own size. The park is quite large, and is best for busy dogs that like to run. Located in Charlottesville, Virginia, Azalea Park consists of 23 acres of land with an enclosed space for off the leash playtime. When not in the enclosure, dogs must remain on the leash. Azalea is one of the most beautiful parks in the state, so whether you’re going on an afternoon walk or letting your furry friend bound around, you can’t go wrong. Barker Field in Richmond, Virginia, has one motto: It’s “where a dog can be a dog.” This multi-acre dog park is fenced in so canines can run off the leash. The surrounding wooded area provides for nice ambience. Donations keep Barker Field up to date with the latest equipment and facilities. The Bea Arthur dog park is a one-acre park next to PETA headquarters in Norfolk, Virginia. Facilities include a swimming ramp, plants, trees, and a pergola for shade, as well as a toy bin, water station, and shaded picnic area. In addition, the constant live stream on the PETA website means you can always check up on how your favorite pet is getting along. The Virginia Recreation and Park Society recognized the James Hunter Dog Park (or Clarendon Dog Park) in 2014 as “Best New Facility.” “From using rainwater for irrigation to solar power to native plantings to increasing the urban tree canopy, this park is at the forefront of environmental sustainability,” the group said. Besides offering a nice open space for dogs to frolic, the park hosts regular events. Check their website for details. Another award winner, the Chesapeake City Dog Park won the “Best New Facility in Virginia Award” upon opening in 2008. Since then, it has maintained excellence through expansion. The 1.5-acre park has recently added a second enclosure for dogs under 25 pounds. Chesapeake residents can do no wrong by stopping by. The Woodstock Community Dog Park in Virginia Beach gives locals an off-leash excursion for their favorite furry pals. Be prepared to pay an annual fee and show proof of vaccination and license, however. This added bit of protection ensures that your pet will remain as safe as possible to enjoy dog parks like this one all over the state. The Duke Street Dog Park provides a large, fenced-in area for dogs to run off-leash surrounded by a nice wooded area. While other dog parks exist in Alexandria, Virginia, many locals seem to prefer Duke Street for its extra space. Even though there are no off-leash areas in the Great Falls Park, dogs are welcome on all the trails, waterfall overlooks, and in the picnic areas. 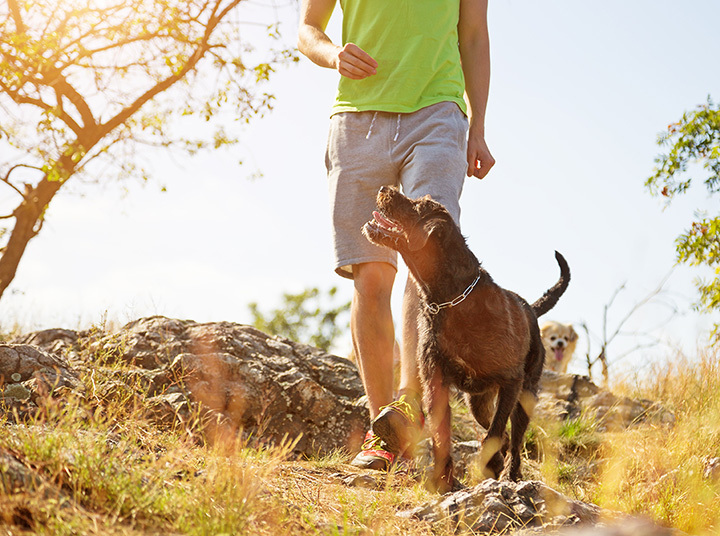 Owners must use a six-foot leash at all times, but if you’re in the market for a nice hike with your dog, then Great Falls could be just the ticket. Make sure to keep a diligent eye out, however, as snakes and coyotes live in the park. The Winsor Castle Dog Park in Smithfield, Virginia, is located on the Windsor Castle Farms estate. The dog park has two exercise areas and water stations surrounded by over one thousand acres of farmland. A small registration fee is required to use the estate, but the atmosphere is well worth it. View more Virginia Dog Parks.